Aurora Keys has dreamed of the Vanderlind Castle ever since she was a little girl. But the fiercely private Vanderlinds keep the massive structure strictly off limits to visitors. Until one night, the wealthy family throws a party —- not just a small soiree, but a huge black-tie affair. No one from the town of Tiburon, Ohio, is invited —- not even the mayor. But Aurora’s best friend, Blossom, has a foolproof plan for the two of them to sneak in. I'm a sucker (no pun intended) for a good vampire novel. 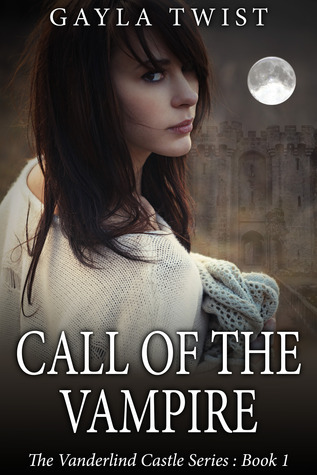 I was excited to take on Call of the Vampire for review because the new vampire novels that are coming out are intriguing. There's always some new twist on the "vampire" itself it seems - Some good, some not so good... (Meyer = Sparkles). LoL In this novel, the vampires can fly/float/what would you call it since they don't have wings, Ha. The author also throws the twist in that vampirism can be a "family thing." I liked that twist - families refusing to give up their families members so after they have kids and enter their 20's, they're turned so they can live forever. That makes it interesting. Call of the Vampire had me hooked by the mystery aspect alone - I adore old castles and mysteries that surround them. I adore the fact that the Vanderlind's had their castle taken apart stone by stone and moved to America. However, I was amazed that it was Ohio that was their destination. Of all the places? No offense to Ohio or anything, I've actually been through and it's a beautiful place - it just seems a little random right? - it's like placing your finger on a map and slamming your finger down on the first place you come to. Maybe it was chosen because it doesn't draw too much attention? Hmm things to think about right? The characters are great in this novel. Each has their own very distinct personality. They're easy to keep straight & interesting enough that you want to follow each of them to see what they do next. However, they aren't over the top with their personalities. There's a good balance with the characters. Aurora's character was easy to love and cheer for. I did have a few moments where I couldn't help but roll my eyes because she was being a little too childish (dancing with the tux), but overall, you could tell that she acted more mature as compared to others her age. She is very protective of those she loves and very responsible. You learn enough about Jessie to love him but not enough about him to stave off your curiosity and drive to know more. I feel like Aurora doesn't even really KNOW much about him. We get a feel for his background and what his life has been life, but you don't know much about who he is now. He's gentle, respectful, emotional, holds on to his humanity and compassion, and loved Aurora's Great Grandmother's Sister Colette to no end. You know his dad died a human, his mom's side is a little messed up, and his brother seems like a total douche. But still, I felt like I didn't KNOW him? I don't know if I'm making any sense at all... It's hard to put into words. That sounds like something negative, but really, it's not. It leaves a lot of room for book 2 to continue opening our eyes and hearts to who Jessie really is deep down. Gayla puts a neat twist in the plot when it comes to Colette's death. Was it possible for Colette to be reincarnated as Aurora? How Aurora is able to dream about Colette if that's not the case... It's a big mystery that I hope ends up being explained in book 2. I know that this is novel #1 for a series so there's a lot of questions left unanswered. I won't lie when I say that the ending did leave me a little empty inside. I wasn't happy about that part but, again, I know this is the start to a series so I'm holding out hope. I'm a sucker for a happy ending. Overall, this was a really intriguing, mysterious, and thought provoking new vampire tale. I thoroughly enjoyed it and cannot wait to get my hands on book 2 later this year! Cover: 5 Stars - beautiful cover!